Maria Chapdelaine was written by Louis Hemon. 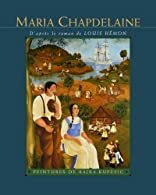 Maria Chapdelaine was published by Bernard Grasset. About Louis Hemon (Author) : Louis Hemon is a published author of children's books. Some of the published credits of Louis Hemon include Maria Chapdelaine, Maria Chapdelaine.